Commander (2018 Edition) decks come out August 10! Head to a store near you to pick up the newest Commander decks, then start planning how you can personalize your deck and perfect your play style. Commander (2018 Edition) is an excellent way to jump into Commander. If you're a veteran of the 100-card format, it can be hard to recall the time when finding so many different cards for one deck was daunting. But with a deck ready to go, getting to the good part of Commander (playing games) is fast and easy. Then you make some changes anyway. There's no such thing as a perfect Commander deck, and once you've tried out something off the shelf, it's natural to want to change it up. With tens of thousands of cards to choose from, there's always something to tweak. Updating a deck isn't something you do for the sake of doing it—updates are what makes our decks unique and personal to how we play Magic. You and I might share the same commander, but what we're trying to do and how we build our decks to do it can vary widely. Updating lets you try new things in new combinations to discover new ways you enjoy playing. Exploring is what makes Commander so engrossing as a format. How Do You Update a Commander Deck? Updating a deck for Standard or Modern is different than tweaking your Draft deck between games, which is different from fiddling with your Commander deck. Every format has its quirks, and with Commander, you'll find you make changes to your deck for a few broad reasons. You need to answer something. Sometimes we forget to put enchantment removal into a deck. Sometimes we find our friends play way more artifacts than the other group we played with before. Sometimes we need ways to recover if we fall behind. Adjusting the ways we interact—fight!—opponents is important to reflect on after games. You want to smooth out how the deck plays. After getting reps in with your deck, you'll notice some cards shine and some . . . don't. Changing out those cards that don't feel good for something else that may work better for you ensures your deck isn't just better (it will be) but more fun. "Exquisite Invention" is the blue-red artifacts deck in Commander 2018, combining the artifact affinity of each color into a Rube Goldberg machine of fun. While we won't have many reps in for making changes based on play experience, we can take a look at what we're starting with to tweak based on the things we want to do. First, here's what's going on with the deck. Very focused theme puts guide rails down for exploration. Two colors are easier to manage than three. Powerful options from across Magic history make personalization easier. Artifacts have plenty of synergy to draw upon—artifacts that care about artifacts is more common than you might think! Artifacts can be fragile in Commander; there are plenty of "destroy target artifact" effects in most decks. Accessing permanent removal is tougher; blue and red can't exile or destroy creatures like white and black. Broadly speaking, updating "Exquisite Invention" is about looking closer at artifacts and how to make them even stronger. The deck comes packed with ways to generate artifacts, but adding a few ways to find them, get them into play, and benefit more from them will strengthen the deck and ensure it packs more of its punch in every game. For today, let's look at some low-synergy cards that don't cooperate with the theme and pull some high-synergy cards that can swap in their place. Enchanter's Bane feels like a fine addition to general Commander, as good enchantments will lead to good damage, but it doesn't do anything for our artifacts. Varchild, Betrayer of Kjeldor is an awesome flavor win but doesn't do anything for artifacts. Loyal Drake is a good boy, but it's slow card drawing isn't as powerful as other options. The same goes for Tidings. Magmaquake can clear out planeswalkers in addition to creatures on the ground, but with a good air force of Thopter tokens, we can find a better removal spell here. Coveted Jewel will definitely keep a game moving, but perhaps giving so much value to opponents isn't the best call. Loyal Apprentice is a fine early drop, but one conditional Thopter each turn is slower than we want if our plan is to win. Low-synergy cards aren't "bad" cards, but pushing the artifact theme further means finding ways to add cards that provide more value with others in the deck. "High synergy" is a bit nebulous. Better synergy for a deck can be removal and answers for opponents, cards that match and support an existing strategy in the deck, or even just redundant flavors of the same kind of cards—like how Kodama's Reach and Cultivate are two of the same effect. For our purposes, we'll look at synergy to support the artifacts with which we're going to win. Trophy Mage and Treasure Mage track down key artifacts we want, plus arrive early enough to attack or block for us. Sword of Vengeance adds haste (and a bunch of other abilities) to a creature, speeding up our attacks. 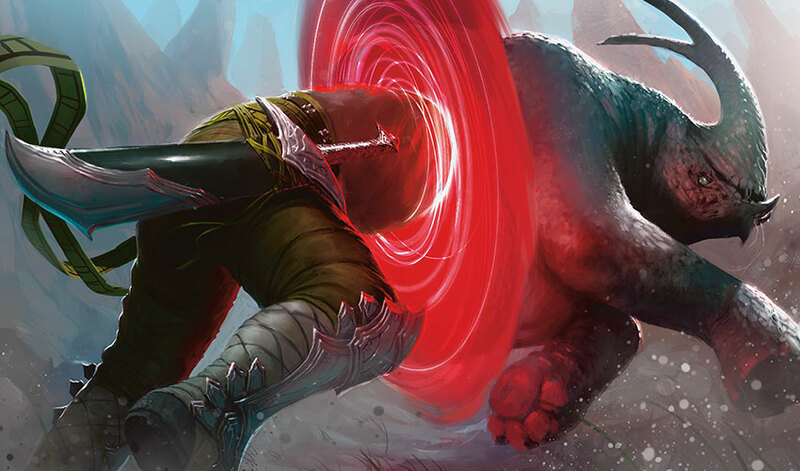 Nevinyrral's Disk doesn't affect planeswalkers but does clear away all sorts of other annoying things opponents play. Whir of Invention plucks exactly what we want on the spot, a handy trick to hold until we absolutely need it. Similarly, The Antiquities War digs us deep into our deck and can give us a massive army for a turn—5/5 flying Thopters are Dragon-sized! Sai, Master Thopterist and Padeem, Consul of Innovations both supercharge playing artifacts and grease the wheels with extra cards along the way. Scrap Trawler, Myr Retriever, Junk Diver, and Workshop Assistant all recur artifacts in slightly different ways. With so many great artifacts in the deck, easy ways to get some back keep us in the game longer. Jhoira's Familiar and Trading Post play super nice with other artifacts, giving us speed and options to react to how games develop. Spine of Ish Sah is a big hitter—especially as it can hit planeswalkers and enchantments—but Mirage Mirror is truly a remarkable artifact from Hour of Devastation. Copying not just your things but other players' as well means you can leverage some of the best you don't get to bring in your own deck. Wayfarer's Bauble and Mycosynth Wellspring both play the part of mana rocks but get lands out of your deck so you don't draw them. Of course, the list of things that work is much larger than the list of things that I'd immediately cut—but that's exactly why I recommend you play the deck a few times before tweaking anything. Finding the cards that look good in a list but underperform in play only comes from experiencing the deck. Don't just swap cards to make changes, make changes based on what actually needs to be swapped!